Speculation and rumour in the run up to Elon Musk's latest unveiling was rife, with a number of internet commenters claiming the real-life Tony Stark was about to drop the silk sheet on a fully autonomous vehicle. The reality isn't quite as exciting because the Tesla P85D is simply a faster and safer saloon, which has received a number of tweaks in order for it to keep up the pace with rival, petrol-powered premium offerings from the likes of Mercedes, Audi and BMW. 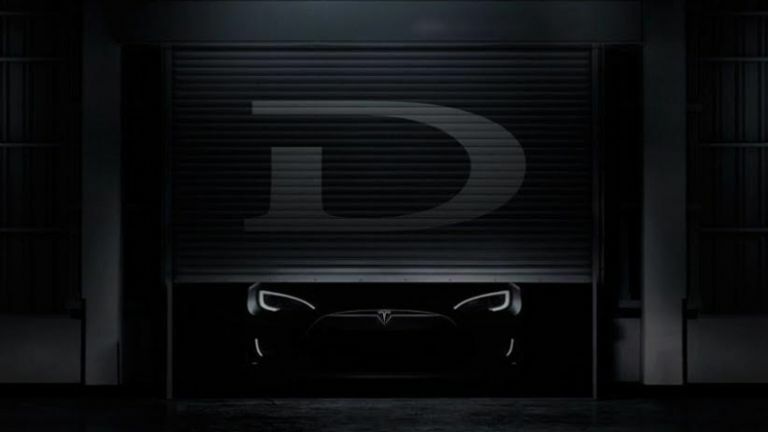 Musk revealed at a glitzy bash in Hawthorne, California last night that the 'D' he has been referring to on Twitter for a week or so now actually stands for "dual motor". In plain English that means engineers have added a second electric motor, so both front and rear axles are now driven by individual power sources. The result is a vehicle that can accelerate from 0-60mph in just 3.2 seconds and go on to a top speed of 250km/h (155mph) rather than the 210km/h (130mph) found in the standard Model S. Battery range has also been extended by ten miles to 275 miles on a single charge in the top-of-the-range P85D models. Those figures are mighty impressive, with the claimed 0-60mph sprint time rivalling the most potent offerings from Porsche and Ferrari. Musk said: "This car is nuts. It's like taking off from a carrier deck," when describing the face melting sprint from a standstill but also went on to explain that a number of safety features had been added. The all-wheel-drive system offers increased grip in slippery conditions, a USP that has seen Audi's Quattro models fly off the forecourts for many years. It will be particularly welcome in countries such as Norway, which only have a high concentration of Teslas thanks to tax breaks and a superior charging network, but plenty of snow and ice as well. Improved software means the updated Model S can steer itself back into lane should the driver accidentally let it wander, it will automatically brake if an unseen obstacle unexpectedly presents itself. The addition of an improved camera system means the updated models can read road signs and register the local speed limits. Drivers will then be warned if they are travelling too fast. This sort of technology can be found on a number of current models from Volvo, BMW, and Mercedes but Musk claims innovation in so much as the latest car can autonomously manoeuvre itself into the correct lane, judging the on-board cameras don't sense any dangers, when the driver indicates. Musk was keen to point out that these "auto pilot" features still require input from the driver. He said Tesla owners can't "safely fall asleep" behind the wheel, but he did hint at the fact that the car could be 'summoned' remotely, which will surely please Knight Rider fans across the globe. Don't think about doing this on public roads, though, private driveways only. The P85D is available to order from Tesla's website now, priced at $120,000 (£75,000) but customers will also be able to select 60D models that boast smaller batteries and a slightly less painful price tag.